@LawlessPirate Makes you wonder how stupid they think we are! The network had used a screengrab of the very popular video game to tell its story. The post-apocalyptic role-playing adventure features a mini game where players “hack” terminals to get access to computer systems and internal correspondence. The video clip has since been updated and no longer shows the awkward moment. In reality, the hacking game is more like a word puzzle in the jumble of letters on the computer screen. Although it doesn’t portray hacking in reality, CNN deemed the footage ideal to use for a story about Russian hacking. Poofylicious took a screen grab of the CNN story and the news soon spread on Reddit and other social media platforms. Comment from discussion CNN uses Fallout hacking footage to show how Russians hack..
@jazzhandmcfeels The green monochrome is kind of a give away. That went away with the 1980s. @FacMagnaAmerica@CNN#msnbc Staging #fakenews is their specialty! Propaganda mills like this have no shame or honesty & knows no bounds! CNN is the epitome of lying, manipulative FAKE NEWS. Only cretins Watch it & sub- cretins Believe it. Even Bethesda Game Studios, creators of the Fallout games got in on the joke. 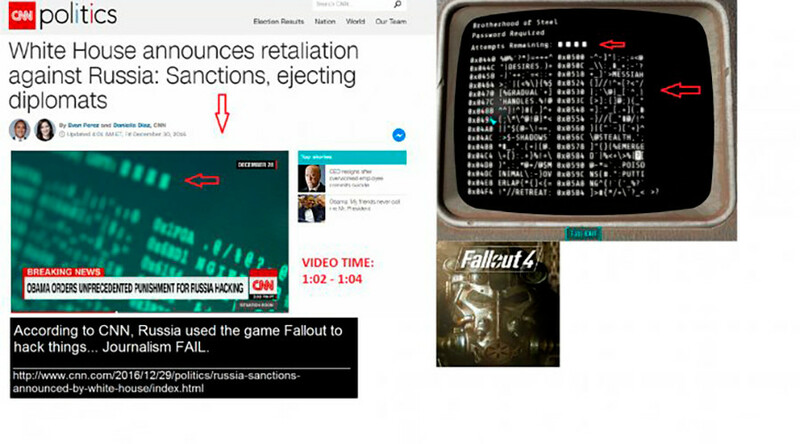 @BethesdaStudios@whoismrrobot Proof Bethesda are Russian hackers. Others used the opportunity to mock the Russian hacking narrative. @LawlessPirate Next thing you know they'll find a "Russian Drone" that looks just like ED-E.